All lesson plans are in a printable Adobe Reader (.pdf) format. The following activities were designed to facilitate as well as enhance teacher instruction on a variety of topics under the larger heading of "Greenhouse Gases and Earth's Changing Climate." Topics range from the simplistic to the more complex- from Dr. Seuss' "The Lorax" to computation activities focusing on the formation of CFCs and the Rule of Ninety. Each group of activities is preceded by a Teacher Background section intended to provide a thorough yet condensed version of the science incorporated within the teaching activity. It is assumed that the teacher has at least a general knowledge of scientific terminology and processes within the disciplines of Earth and Physical science. The intended audience ranges from elementary to high school science. Their instructional use and application is left entirely to the discretion of the classroom teacher. Activities are intended to be modified to meet the variety of learning styles and ability levels present in a typical classroom. Teachers are encouraged to adapt them as they see fit. Each module is tied to one of the 50 climgraphs available on the NOAA ESRL/Global Systems Division website. The transparencies which can be made from these illustrations are meant to serve as a visual tool for presenting the basic concept being taught. Transparencies can be used alone or in conjunction with others, in sequence or out and should be selected to coincide with the ability, interest and cognitive level of the students. All of the materials in the "Greenhouse Gases and Earth's Changing Climate" curriculum were prepared by a science education specialist in collaboration with scientists and technicians at the National Oceanic and Atmospheric Administration David Skaggs Research Center in Boulder, CO.
Module #1: The Earth in Space This unit is about the Earth and its systems. Students will define a living thing, provide evidence for a thing to be living or not, and evaluate whether an ecosystem is alive. Students will make a simple model of the Earth system, which will require them to observe, keep records, and analyze the activities of their models and variables that affect them. Students will then report their results to the class and write a summary of their research. Students will identify and understand the divisions of geologic time scale and analyze what geologic and biologic changes have occurred throughout geologic time. Students will also create a scale model of the geologic time scale to describe the different eras, periods, and epochs. Students will understand how satellite imagery is used to observe and interpret Earth’s atmospheric conditions, and they will evaluate the advantages of different types of satellite images. Teaching Activity: Do You Really Need a Thneed? Students will identify the needs of a society on development and technology, and they will identify the positive and negative impacts of development and technology on society and the environment. Module #2: Energy From the Sun This unit is about Waves, Light, and Energy. This activity will help students understand the concept of energy. Students will develop a working knowledge of the electromagnetic spectrum, and students will be able to provide real life examples or different types of electromagnetic energy. Students will display the colors of the visible spectrum contained in sunlight. Students will show how atoms and molecules in the Earth’s atmosphere absorb energy through resonance. Students will demonstrate the relationship between wave frequency and energy in the electromagnetic spectrum. Students will illustrate how the gases in the atmosphere scatter some wavelengths of visible light more than others. Students will observe various lights and elements through spectroscopes to compare the various spectrums that each light source has. Module #3: The Major Earth Systems This unit is about how water and living things interact. Teaching Activity: How have the atmosphere and living things interacted over time? Students will construct and cumulative line graph depicting changes over time, identify major geologic events on the same graph, and plot the percentages of various gases present in the Earth’s atmosphere. Students will also interpret the graph relating the events to the changes in the atmosphere and make a prediction about the outcome of the investigation. Students will model the relationship between the states of matter (specifically water) and heat energy. Students will also simulate the Earth’s water cycle and evaluate/ quantify the exchange of water within the Earth’s hydrologic cycle. Students will simulate the capacity of air to hold water vapor and see that it varies with temperature. Students will also create a model to explain the relationship between “capacity” of air to hold water and the actual amount of water vapor in the air. Module #4: The Earth's Atmosphere This unit is about the Earth’s atmosphere and its various patterns of temperature, pressure, and height. Students will describe the formation of the Earth’s atmosphere, explain how chemical reactions in the atmosphere produced nitrogen, hydrogen, and carbon dioxide, and describe the formation of the ozone shield. Students will research the Earth’s atmospheric gases and illustrate that information in a spreadsheet. Students will also compute the approximate percentage of the Earth’s atmospheric gases by volume. Students will identify the characteristics of the layers of the Earth’s atmosphere and analyze the spatial relationships of the atmospheric layers and interfaces. Students will construct a graph which illustrates the temperature and air pressure patterns in the Earth’s atmosphere, and they will draw conclusions from those graphs regarding the temperature, pressure, and altitude relationship. Students will illustrate convection currents in water. Students will create and analyze a line graph of atmospheric gas concentrations over time. Students will calculate the approximate value of storm precipitation, estimate the surface water evaporated to supply the storm, evaluate the amount of fresh water runoff from the storm, and explain how topographic features affect precipitation amounts. Module #5: Earth's Radiative Heat Budget This unit is about the energy that the Earth receives and emits. Students will describe and illustrate the distribution of solar energy received by the Earth. Students will create and use a small scale model to observe the factors affecting both energy absorption and emission in Earth materials. Module #6: The Greenhouse Effect This unit is about the Greenhouse Effect. Students will form a model of the heating of the Earth’s atmosphere and be provided with an opportunity to build and test a physical model analogous to the atmospheric greenhouse effect. Students will also practice setting up a controlled experiment, recording data, graphing, and analyzing results. Students will understand the greenhouse effect and recognize the difference between a scientific face (the greenhouse effect) and an unproven scientific hypothesis (global warming). Students will understand that gases un the atmosphere affect the temperatures at the Earth’s surface and model the Earth’s greenhouse effect by using student’s bodies as the Earth. Module #7: The Greenhouse Gases This unit is about Greenhouse Gases and the Earth. Students will create a data table of information on the atmospheric trace gases that are radiatively active and play a significant role in global change. Students will also analyze information on specific trace gases and evaluate how it contributes to their role in global change. Teaching Activity: What's So Special About CO2? Students will understand the concept of resonance frequency and simulate the resonance frequency of certain molecules using models with different characteristics. Teaching Activity: Now What's a Billion? Students will provide a visual model of the specific units (millions, billions etc) used in the measurement of the abundance of gas species in the atmosphere. Students will illustrate ppm and ppb concentration levels. Students will also correlate those concentrations to the amount of greenhouse gases in the environment. Module #8: The Greenhouse Effects of Earth, Venus and Mars This unit is about the greenhouse effects of Earth, Venus, and Mars. 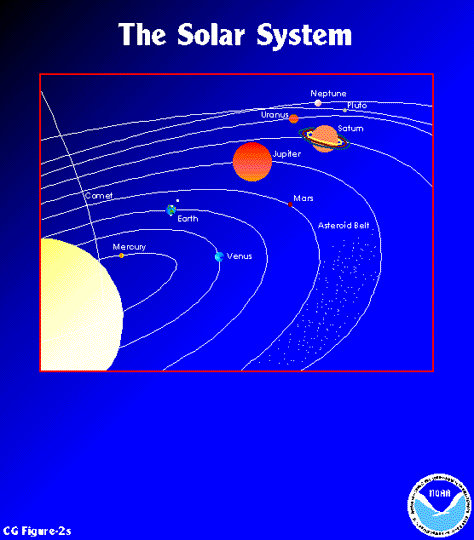 Students will analyze a data table of the characteristics of Venus, Earth, and Mars. Students will also present the information from the data in a visual format, and identify those factors which appear to be the most important in determining the habitability of a planet. Students will relate climate change to the theory of feedback mechanisms through a problem solving activity. Students will define adaption and describe several adaptions that would help a creature live on Venus or Mars. Students will also research information on Venus and Mars in preparation for designing an alien creature. Module #9: Earth's Climate System This unit is about Earth’s climate. Students will identify the factors that affect the climate of a region and identify and analyze the effects that various factors have on the climate of a hypothetical region of the globe. Students will identify the Earth’s climate zones by isotherm boundaries and analyze a map of the Earth’s climate zones. Students will understand the relationship between precipitation and potential evapotranspiration in classifying climate types. Students will also use climate ratios to classify climates into four types: arid, semiarid, subhumid, and humid. Students will create climatograms of ten identified regions of the globe and focus attention on the relationship between climatic factors and biota. Module #10: Natural Climate Change This unit is about how climate has changed naturally over the last few thousand years. Students will plot the location of sunspots by latitude/ longitude on a grid of the Sun, and they will also recognize the pattern in sunspot location that occurs as a result of heat transfer and the rotation of the Sun. Students will create a line graph using data to illustrate that sunspots occur in cycles. Students will also evaluate and draw conclusions about the behavior of sunspots based in the background information and the data provided. Students will plot the locations of the earthquakes around the globe, analyze fossil evidence and hypothesize regarding the events that determined their locations, and determine the arrangement of the Earth’s continents in the past as a result of fossils evidence. Students will also understand that the movement of the Earth’s crustal plates over time has influenced regional climate conditions. Students will locate major volcanoes around the world using latitude and longitude, explain how the latitudinal location of the volcanic activity may affect global climate conditions, and use the Volcanic Explosivity Index (VEI) to predict the potential of a volcanic eruption to affect global climate. Students will also examine the dispersal of aerosols throughout the atmosphere after a volcanic eruption. Students will analyze the growth of tree rings and determine what information can be determined about growth and environment conditions from analyzing a cross section of a tree trunk. Students will simulate investigations using tree ring core samples, conduct a 50 year climate history, and record the chronology of the tree rings on a time line to highlight significant social, personal, and scientific events. Students will learn about changes that have taken place in greenhouse gas and average annual temperatures within the recent past (to 160,000 years ago). Students will also make graphs of actual research data and find trends as illustrated by the graphed data and draw valid conclusions. Students will understand the concept of radioactivity and radioactivity and radioactive decay and simulate the radioactive decay process using the imaginary chemical element "Zorkium". Students will compute the percent growth for each of the greenhouse gases for different time segments from 1850 to 2030. Students will also create a line graph showing the percentage of growth from 1850-2030. Students will analyze greenhouse gas emissions on a global scale, compute the total greenhouse gas emissions for 50 countries, and rank countries by their per capita greenhouse gas emissions. Students will describe the characteristics of sound waves and their movement through different mediums, apply the use of sound waves to map the ocean floor, and analyze the relationship between the speed of sound in water and temperature. Students will also illustrate the uses of acoustic monitoring in the global change research. Module #12: Global Fossil Fuel Use This unit is about Global Fossil use, combustion, and hydrocarbons. Students will analyze a graph of US Consumption from 1875 to 1980 and evaluate the energy content of different types of fuels. Students will identify hydrocarbon molecules by the number of carbon atoms and create structural formulas for 10 hydrocarbon molecules. Students will discuss how fossil fuels are formed and why they are considered an environmental problem. They will also demonstrate how fossil fuels are broken down through the process of fractional distillation. Students will observe the effects of incomplete combustion, evaluate the effect of temperature increase on by-product production, and analyze the effect of continued use of energy inefficient fuels on the environment. Module #13: World Population Growth This unit is about world population growth. Students will use dice to model exponential growth, change the variables and attempt to slow down and stop exponential growth, and relate this problem to human population trends and other human behaviors. Students will make predictions and analyze the age make up of different populations, create an age pyramid, and evaluate the factors in the environment and in human society that affect the size of the population. Students will create two pie graphs comparing the causes of death in developing and developed nations, analyze data comparing the causes of death in developing and developed countries, and create a map illustrating the availability of health care around the world. Students will also compute and analyze the possible growth of infectious diseases as a result of global warming and compute the increases in the distribution of infectious diseases for 2050. Module #14: Global Temperatures This unit is about global temperatures and how they are changing. Students will graph 18O and mean annual temperature data, analyze the relationship between the 18O Value and the mean annual temperature, and trace the steps in ice core acquisition and analysis. Students will model the half-life of a simulated radioisotope. Students will evaluate the data from two graphs based on analysis of an ice sample taken by Russian scientists at Vostok Station in East Antarctica and hypothesize about the correlation between CO2 concentrations and global surface temperatures. Students will observe air bubbles trapped in ice cubes and compare them to air trapped in glacial ice. Students will briefly describe the Greenland and Antarctic ice sheets, illustrate how information on ancient climates is preserved in ice cores, and interpret an “ice core” from the Greenland Ice Record. Students will also simulate ice core formation. Module #15: The Global Carbon Budget This unit is about Carbon and the Carbon budget for the world. Students will discuss and compare the physical and chemical properties of carbon and silicon, identify as many sources of carbon and silicon as possible, and view a videotape about carbon v. silicon-based life forms. They will also analyze the possibility/ probability of silicon- based life on other planets and “design” a habitat/ planet for a life form based on silicon. Students will describe the natural cycling of oxygen and carbon dioxide in the Earth system and analyze changes in the Earth’s carbon cycle as a result of human activity. Module #16/17: Sources and Budget of Carbon Dioxide This unit is about the sources and budget of Carbon Dioxide. Students will gain familiarity with the basic properties of CO2. Students will calculate the per capita heating value contributed by several different countries and illustrate that data in several different formats. Students will locate the NOAA/ ESRL Cooperative Air Sampling sites around the world and learn how concentrations of CO2 and other greenhouse gases are measured at the Mauna Loa Observatory, Hawaii. Module #18/19: Sources and Budget of Methane This unit is about Methane (CH4) sources and its budget. Students will build a simple methane generation system, simulate methane production in the natural environment, and determine some of the conditions necessary for the optimum production of methane. Students will read and discuss a scientific article about ruminant animal contributions to global methane concentration, evaluate the process being used at present to measure methane emissions from ruminant animals, and calculate the average amounts of CH4 contributed by different animal species on a daily basis. Students will create a line graph of atmospheric methane concentrations over the past 450 years and analyze the correlation between world population trends and the rise in methane concentrations. Module #20/21: Sources and Budget of Nitrous Oxide This unit is about the sources and the budget of Nitrous Oxide (N2O). Students will describe the steps in the Earth’s nitrogen cycle and create a simple diagram of the nitrogen cycle. Students will examine the structure and function of root nodules in legumes and evaluate the effect of over-use of fertilizers in the natural cycling of nitrogen. Module #22: Sources of Chlorofluorocarbons This unit is about the sources of Chlorofluorocarbons (CFCs). Students will understand the relationships between atoms in simple carbon compounds, compute the number and types of atoms in CFC and HCFC compounds using their code numbers, and arrive at the chemical formulas for CFC and HCFC compounds using the Rule of 90. Module #23: Climate Model Predictions This unit is about climate modeling. Students will gain an understanding that there are many questions about the reliability of computerized climate models. Teaching Activity: How Might Global Warming Affect Australia? Students will analyze the effects of global warming on Australia as predicted by climate models, understand why computer models of global warming show a wide range of predicted effects for Australia, and analyze the difficulties in planning for the possible effects. Students will also recognize that not all of the effects would be harmful. Students will gain an understanding of how difficult it is for climate models to predict sea level increases on the future and examine the possible impact of sea level rise along the Gulf Coast alone. Students will model the relationship between certain variables in the Earth system affecting climate and use a spreadsheet model to test hypotheses about how changes in the Earth[s temperature and energy balance will affect the Earth’s temperature. Students will also learn about the processes and interactions involved in maintaining the Earth’s energy balance and gain an appreciation for their complexity. Finally, students will learn about and appreciate computer modeling as an investigative tool. Module #24: Climate Change Scenarios This unit is about what could happen in the future with climate change. Students will infer what will happen to various kinds of organisms as conditions in their habitats change and predict which kinds of organisms will survive and which will become extinct. Students will trace the effects of a gradual climatic change on a model ecosystem which is simplified from a real situation and explain ways in which environmental factors interact to set limits on geographic ranges. Students will describe the change in water level when water is exposed to heat, differentiate between thermal expansion and melting snow and ice fields as they relate to sea level rise, and predict the impact of rising sea level on coastal areas. Students will simulate the melting of the polar ice caps and the effect it would have on the world’s coastal regions. Students will gain an understanding if the relationship of ice to water and density as the ration between mass and volume. Students will also compute the density of different quantities of water, and they will understand why ice floats. Students will communicate the concept of a chain reaction regarding environmental events and evaluate environmental events and how they might influence life on Earth. Module #25: Controlling Global Warming This unit is about what we could do to slow climate change. Students will research climate change and be given/choose an issue. Students will debate the issue, discuss the arguments afterwards, and then prepare a written summary. Students will be provided with insights into the effects of global warming on a society and culture very different from our own, and they will be provided with experience of looking at environmental issues from viewpoints that may be very different from their own. Students will also be introduced to the concept of an international forum for discussing environmental problems and possible solutions. Students will research information about different interest groups to be represented at a world conference on global warming, plan their strategy for participation in the world conference, and plan proposals for effect, positive and cooperative global actions that will be satisfactory to all interest groups represented. A Day in the Life of a Drip! Alert at the North Pole!